North Korea fired three short-range missiles on Saturday -- all successful -- despite earlier reports suggesting failure, according to the U.S. military. Seoul's Joint Chiefs of Staff said the projectiles fired from the North's eastern coast flew about 155 miles. It said South Korea and U.S. militaries were analyzing the launch and didn't immediately provide more details. According to earlier reports, U.S. Pacific Command spokesman and Cmdr. David Benham suggested two North Korean missiles "failed in flight" while the third one had "blown up almost immediately." The U.S. Pacific Command has since revised its evaluation of the missile launch, now reporting no missile failures -- in line with the South Korean military assessment. Benham said the missiles did not pose a threat to North America or U.S. military facilities on the U.S. territory of Guam. Earlier this month, North Korea created a tense standoff with the United States by threatening to lob some of its missiles toward Guam. South Korea's presidential office held a National Security Council meeting to discuss the missiles, which are the first known launches since July, when the North successfully flight tested a pair of intercontinental ballistic missiles that analysts say could reach deep into the U.S. mainland when perfected. The White House said President Donald Trump -- who has warned he would unleash "fire and fury" if the North continued its threats -- was briefed on the latest North Korean activity and "we are monitoring the situation." The launch came five days after U.S. and South Korean forces began annual military exercises that the North claims are a rehearsal for war. Tensions on the peninsula generally ratchet up during the late summer maneuvers and a series of larger exercises held each spring. Before the latest missile launches were confirmed, North Korean state media said that dictator Kim Jong Un inspected a special operation forces training of the country's army that simulated attacks on South Korean islands along the countries' western sea border in what appeared to be in response to the ongoing U.S.-South Korea war games. North Korea had not launched any missiles since the United Nations Security Council adopted a resolution imposing new sanctions against the rogue nation Aug. 5. Earlier this week, U.S. Secretary of State Rex Tillerson trumpeted the lack of "missile launches or provocative acts" by the North since the resolution was passed. "I am pleased to see that the regime in Pyongyang has certainly demonstrated some level of restraint that we’ve not seen in the past," Tillerson said at the time. At a campaign-style rally Tuesday in Phoenix, President Trump told the crowd that "I respect the fact that I believe [Kim Jong Un] is starting to respect us. I respect that fact very much." 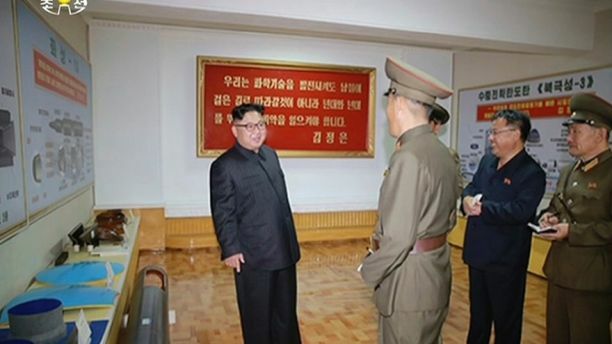 On Wednesday, North Korean state media released photos appearing to show the designs of one or possibly two new missiles hanging on a wall behind Kim while he visited a plant that makes solid-fuel engines for the country's ballistic-missile program. South Korea has also been testing new missiles of its own, including the 497 mile-range Hyunmoo-2. Although the missile has not been operationally deployed yet, it is considered a key component to the so-called "kill chain" pre-emptive strike capability the South is pursuing to cope with the North's growing nuclear and missile threat.